Greetings, our beloved BK analogue community. Thank you so much for all the support and great feedback on the "Love for Analogue User Stories". I am thrilled to share the story of our friend Peter Han. I have always loved his talent in visualization but reading his story made me realize that I also admire the way he continues to explore the tools he puts his hands on and, ultimately, his techniques and creative processes. I am thankful that we can continue to shed light on unique ways and perspectives to approach an authentic life infused with analogue tools. Peter’s first memory is of drawing. His grandfather would sketch little birds for him when he was around four or five years old. It instilled in Peter a deep curiosity of drawing, which has been with him ever since. He remembers hiding under the dining room table at family gatherings, drawing away, and staying there for most of the event. Throughout the years, he's realized that he is able to do what he truly enjoys with the support from his family, friends and the education he received. Peter graduated from ArtCenter College of Design with a Bachelors of Illustration. Shortly thereafter, he started his professional career as a concept artist. During the next seven years, he spent time building his portfolio and gaining experience at a various video game studios in Southern California. He also began teaching at ArtCenter and other institutions picking up his former instructor’s process and passing it down to new generations. Peter eventually left the video game industry and continued down the path of academia and has been teaching the foundations of sketching and visual communication. As he continued to teach, he began to invest more of himself and the kind of work he personally wanted to create. He started by exhibiting at Comic Con in San Diego in 2008 for fun. As a few years passed, with other priorities on his plate, Peter realized that opportunities like these were really strong platforms that would help him build his brand. Today, Peter’s self-published books continue to give him the opportunity to explore the kinds of projects that help him grow as an artist, while his love of teaching gives him passion and meaning in life. "In recent years, teaching has become a passion of mine. It’s the interaction with people and helping them find a path that gives me great satisfaction. After years of coming back to the classroom, I began to learn the nuances of reading people and investing in their growth." Peter uses his analogue system as a visual recording platform and the process satisfies his love of putting pen to paper. Since he has been drawing his entire life, documenting what he observes has become a strong daily routine. It shapes the very way he communicates, his perspective and how he expresses himself. He loves being outside, witnessing nature, and experiencing everything - from the tiniest elements of life to traveling different countries around the world. Compared to digital tools, analogue tools provide Peter with a variety of options to experiment with, such as unique paper surfaces and drawing instruments. He likes to try out multiple products and different brands as he discovers new, fun and appealing ways to sketch. Inspiring others through his visual work, using tangible artifacts people can interact with, provides a sense of drive for him. 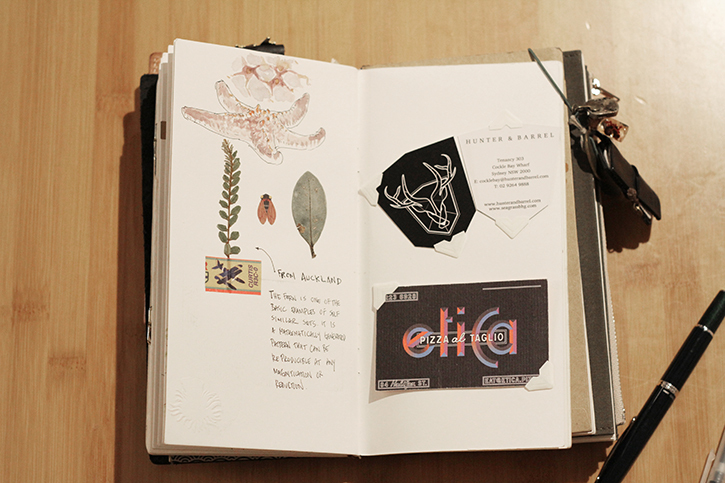 Peter’s analogue system is comprised of varying sketchbooks with different applications. 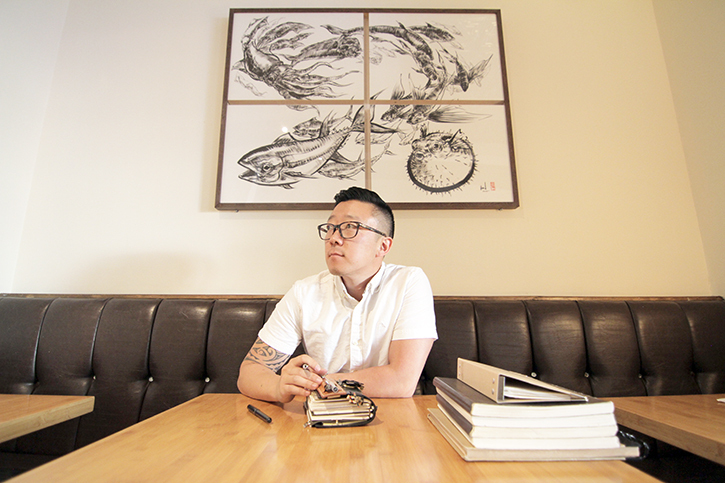 He uses brown tone Cottonwood Arts sketchbooks in his classrooms. 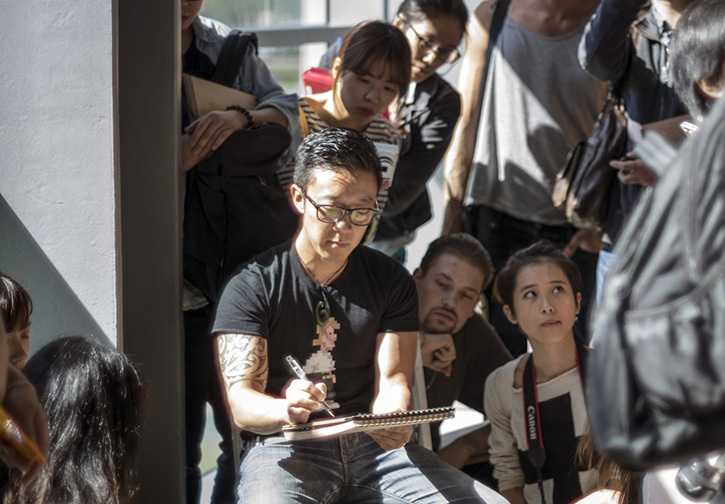 He teaches students to observe and draw on location to gain sketching experience and work on techniques. 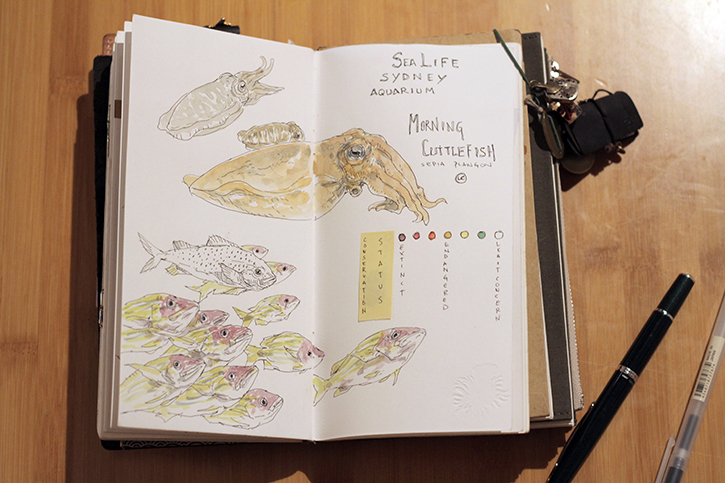 He also uses watercolor sketchbooks in the rotation for personal studies and exploration. 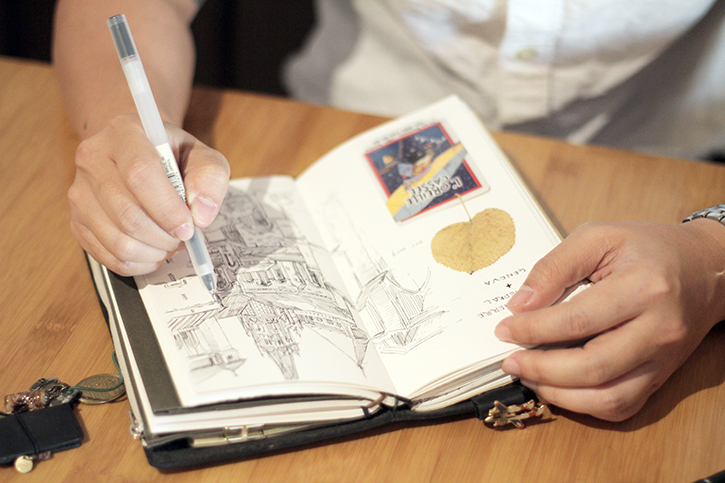 A Traveler’s Notebook is his main system when he travels, to collect his experiences. It is the most unique in terms of how he uses the pages. 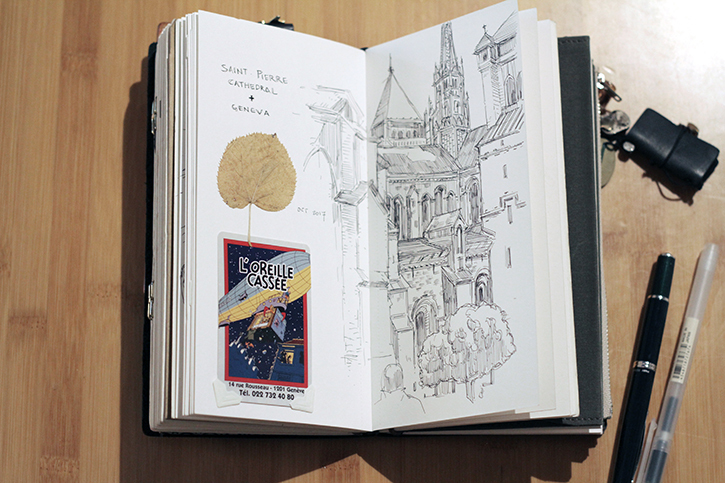 Unlike his sketchbooks, Peter collects items and mementos from his travels and combines writing and sketches to help him remember his trips. 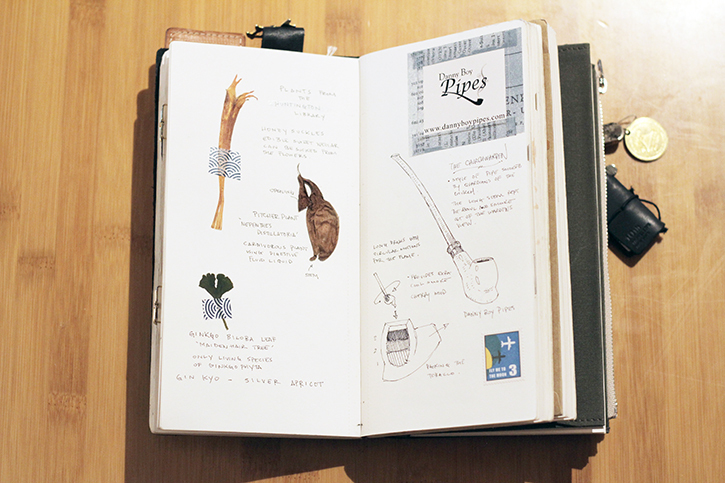 In addition to sketchbooks, Peter explores and collects various types of pens. He has a fondness for good construction and the feel based on materials and visual appeal. He prefers fountain pens and metal tipped pens for his personal use and felt tip pens for his classrooms. Many of Peter’s inspirational sources are located in the Los Angeles area. People often assume you must travel far distances to experience something new or outside of the everyday life; however, Peter has discovered that you can travel a couple of hours in any direction in LA and you are bound to find something great. Some of his favorite spots are Los Angeles Natural History Museum, American Military Museum, Petersen Automotive Museum, and Long Beach Aquarium. As a young kid, Peter’s father would buy him model airplanes. He’d spend hours in his room building them. Piecing them together and finding the right parts kept him enamored and focused. Soon school and his passion for drawing became more of a priority and the craft was put aside. Recently, Peter has reignited his passion for models, not only building them but also researching how to paint and customize them. Peter appreciates the level of creativity that comes into play and truly enjoys the process of putting them together and seeing the possibility of how it could look. A lot of his work derives from this mindset and direction, which enables him to let go of expectations and enjoy the creative process. Peter lives by the philosophy “Whatever you start, see it to the end. Finish it with whatever level of skill you presently have.” If you're unable to accomplish the small steps in-between, you’ll always have a difficult time honing your edge. This mindset applies to all aspects of life for Peter.